Fresh, delicious, chewy and hearty! Adapted from "Everyday Italian: 125 Simple and Delicious Recipes" by Giada De Laurentiis, which I found in this Star article. You can use any type of sweet onion, but try with shallots for a sweeter flavour. Find whole spelt grain in health food stores. Put spelt and water in medium pan. Bring to boil on high heat. Turn heat to medium-low. Cover and simmer until almost tender, about 40 minutes. Add 2 teaspoons salt. Simmer until tender but still chewy, about 10 minutes. Drain well. Transfer to large serving bowl. Cool to room temperature. In a medium bowl, mash garlic and 1/4 teaspoon salt to a paste with a fork or pestle. Whisk in vinegar and pepper. Whisk in oil. Add tomatoes, onion, chives, parsley and basil to the cooled spelt. Toss to combine. Add vinegar mixture. Toss to coat. Adjust salt and pepper if needed. Serve at room temperature. Makes about 6 cups. I really enjoy your blog and look forward to your new posts! Thanks for your comments, radiantfire! Yes, tomatoes are too water-heavy for watery Kaphas... same goes with other watery foods like cucumbers, zucchinis, melons, oranges, and tropical fruit. Best to stick to drier fruits and vegetables! 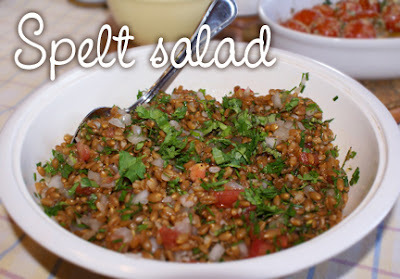 Spelt salad look so yummy! and the recipe is really easy to prepare it.However, I would like to know if I can substitute the olive oil by and vegetable oil, I if you could answer my question I really appreciate it. I'd love to answer your question, viagra online, but considering you are viagra online I'm doubtful you're for real. I'll delete your comment in a week if there's no reply! I just made this over the weekend. Yum! Thanks for posting. Does Spelt increase Vata? I thought it was a "heavier"/"nuttier" grain, which should be fine for Vata?